I heard a song on the radio that made me pause. 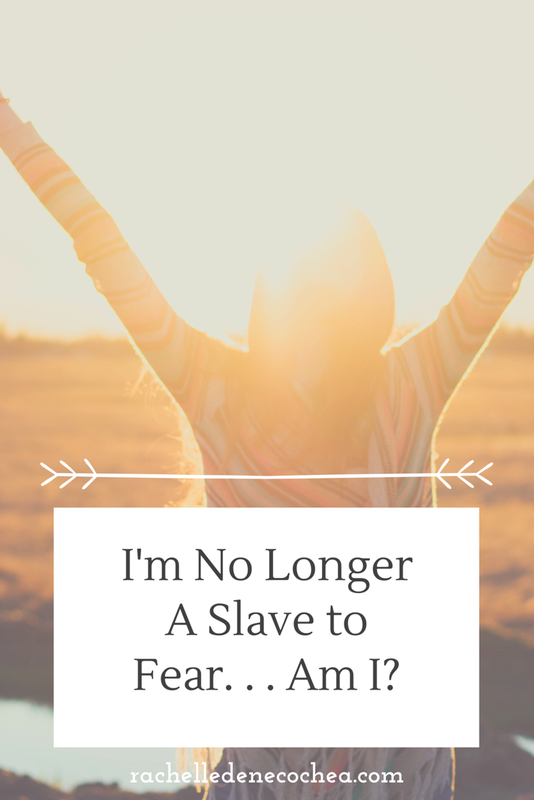 It’s a Bethel worship song called, “No Longer Slaves.” Even if your spiritual beliefs don’t encompass Christianity, that’s okay, this post isn’t about religion, it’s more of an observation. Listening to haunting voices sing this over and over and over again spread goosebumps all over my body and pumped empowerment through my veins. These last few weeks of being brave everyday have given me a new perspective on fear. Before January, fear was an entity. Something huge and identifiable. It’s the bump in the night. It’s anxiety over your eighteen-year old driving home in the fog. It’s a million worst case scenarios. We’re no longer a slave to fear. I used to believe this. After all, I worked hard to purge my life of it. Granted, I came out of those years of hard work virtually fear free. I mean, I can walk through a pitch dark room and I’m taking baths without panic attacks (huge steps for me for reasons this blog is not about). I’m not so sure anymore. If fear wasn’t still deeply entrenched in my psyche why do I need a Brave Year? And why do I still run into opportunities to be brave everyday? They might be small, but even the tiniest fear, if I cower, makes me a slave to it right? It’s not the presence of fear that’s my issue here, it’s the message of the song. The message is about identity. Who we are: Children of God. The Bible says, as Children of God, we are blessed, we are light, we are holy. We are powerful, fully alive, complete. We are full of love and have direct access to God. Which, no matter what you believe spiritually is beautiful and empowering. But just because the Bible says it, and just because we believe it, and just because some of us sing those words on Sunday morning or at the top of our lungs in the car, doesn’t make it true in our day to day lives. I mean, it’s true. We aren’t slaves to fear, but we act like we are. Sometimes in the big things, but more often it manifests in the small things. I usually identify it by an automatic “no” response. Do you want to take a dance class with me? Do you want to learn how to speak French? Do you want to go to skydiving? Do you want to take a look at the hurt behind that anger? Do you want to look that panhandler in the eye and see his humanity? What if we took a real, honest look at our behavior? What would we find? Are you anything like me? When someone or something pushes you out of your comfort zone, do you freak out a little? Maybe not on the outside, but on the inside. Do you spasm and maybe growl and search around like a desperate wild animal for a place to hide? It’s like fear beckons us and we sprint into our prefrabricated jail cells, snap on our chains, and think, Whew! Now I’m safe. Safe to live a half life. Safe to not live the life we were born to live. Safe to not accomplish our dreams. Safe to live in our cushioned world where nothing can touch us. Unfortunately, I know from first hand experience that no matter the precautions I take, no matter how much I worry, no matter how safe I think I am, horrific stuff still happens. The safety of the jail cell and chains are just a façade. But what if I actually believed I was a child of God? What if I actually believed in my worth? In my gifts? In my God given right as a human being to contribute positively to this world? That I’m powerful and complete? I’m betting the difference it would make in my life and the lives of my family would be unimaginable. I want to live the answer to that question. I want to know what I am capable of. I want to know that I have given my all and not left a single scrap behind for fear to nourish it’s scrawny hide on. This is why I have chosen to be brave everyday this year. Already, in just four weeks, I’ve noticed a huge shift in my perspective. I find myself aware of the automatic no response and more excited than scared about saying yes. If this much has shifted, where will I be on day 365? What about you? What would your life be like if you emerged from that comfortable cell? What would be the first thing you would say “yes” to? I don’t know how I missed this post before! It’s so BEAUTIFUL! Thinking about how often I hide behind business (busy- ness) but it’s really fear. You, my friend, are inspiring! This is such a great post. I struggle with fear of all kinds and sizes, but I think I’d like to try a Brave Year, too. It always helps me to remember that there can be no bravery without fear. The fearless don’t have anything to overcome. But when we’re fearful and do something anyway, that’s when we become brave. That’s when we can give God the glory for strengthening us. Enjoy the rest of your Brave Year! I hope next year will be one, too! Thank you! In the months it took me to reply, have you done any brave things? I love to hear other people’s stories. It helps to know I’m not alone. 🙂 This year I’m focusing on risk. The fear of failure generally stops me from acting on the risks I need to take to achieve my goals/dreams. So, not only am I planning to risk, I’m planning to embrace failure as part of growth and learning. Deep breath! I can do this.